Vali: We had to go to the human world and everything…. I do find it entertaining that Coal is basically acting all "ah you're acting like PARENTS I'm going WALKING blah" like a teenager though. XD Can't wait for next week! Haha, yeah Coal’s being a little angsty I guess, but he is fifteen! He’s allowed to be. And that is quite the random conversation! *Has the sudden vision of a Coal Puppet hitting its head on a wall* Angst, angst, angst! Sigyn’s eyes are sort or creepy in that last pair of panels. o.o Witchy Woman, she’s got the moon in her eyes…. I love the detail on her bonnet and the smoke. Beautiful work! Thank you! I can’t answer those questions. D: But yeah Coal left the house, the next page will make that clear. I, too, love Coal acting like a disgruntled, angsty teen. I hope Loki is a good influence on him (which is leaving a lot to hope!). Haha! That’s true. Loki’s not as bad as he was, at least. Still, there are probably better role models. OMG. 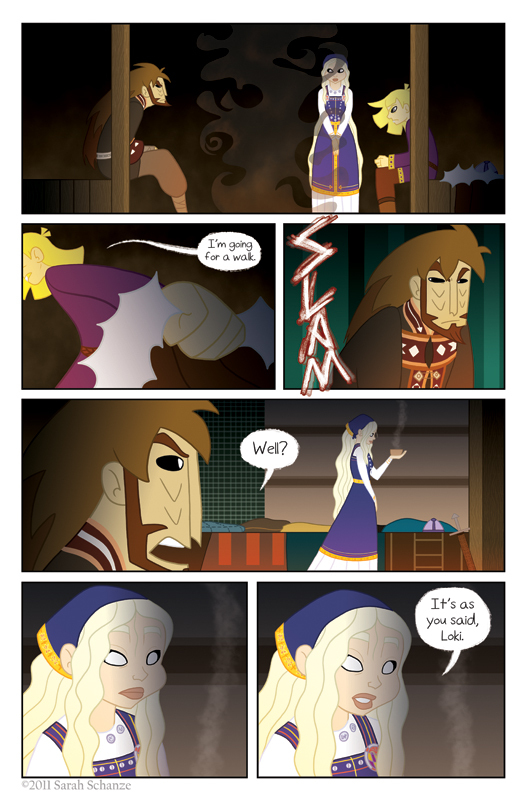 she has no pupils…..Page 18: why is she petting her son like a cat. He looks like he is about to purr. I think it has something to do with the Freudian implications of mother – to – child. As kids we respond highly to being petted. Haha, well the jotnar eyes are definitely creepy like that, since they’re white on black. And she’s not so much petting him as just moving some hair out of his face, but it is a comforting, calming sort of gesture since the boys are getting sleepy. I’m really liking the contrast in characters in these recent pages, it helps the story flow.